Most organizations manage eDiscovery on a matter-by-matter basis, stuck in a reactive nightmare that plays over and over. This approach is both costly and risk-laden. Organizations don’t have the time or tools to cull down collected data sets, resulting in unnecessarily expensive third-party data processing and legal review. The matter-by-matter approach also leads to inconsistencies in how the same data is treated across matters and more movement of data from application to application, raising the chances for spoliation and sanctions. As eDiscovery gains a higher profile in the mainstream news and on the corporate radar, there is a strong desire to reduce both costs and risk. 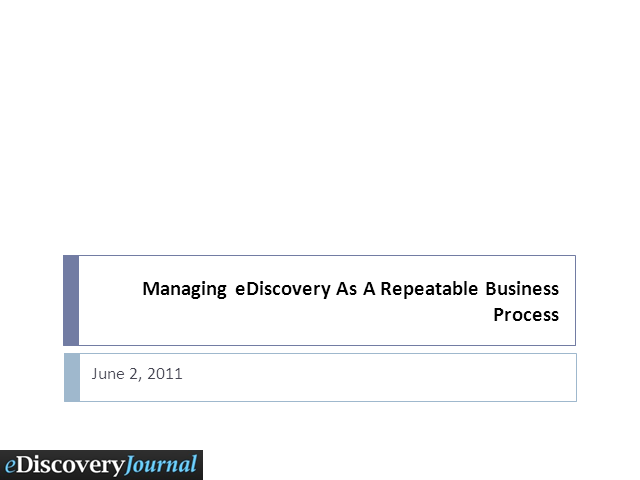 The way to do this is to approach eDiscovery as a manageable, repeatable business process. This webinar will explore the components of the eDiscovery process and the role of various constituents (e.g. Corporate legal, law firm, service provider) within the process. We will also present how technology and service solutions can support managing eDiscovery and the trends that affect decision making, such as the emergence of more integrated eDiscovery platforms.